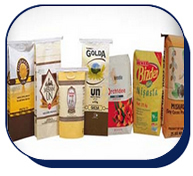 Packing of foodstuffs with kraft paper provides presentation of the material inside without any decomposition, exposure to dust, dirt, etc, external effects for a long period (6 months – 1 year) under hygienic conditions, safely and suitable to human health with breathing kraft paper. It contributes to the product to be best introduced in the market with printing implemented with water base ink which does not constitute harm to the food. Problems such as bug-infestation, moisture, astringency are eliminated by kraft sack’s breathing feature. and for similar products, 5 kg, 10 kg, 15 kg, 20 kg, 25 kg and 50 kg valve hexagonal bottom and open mouth(open mouth sewn, gusseted , handle) sacks are recommended.